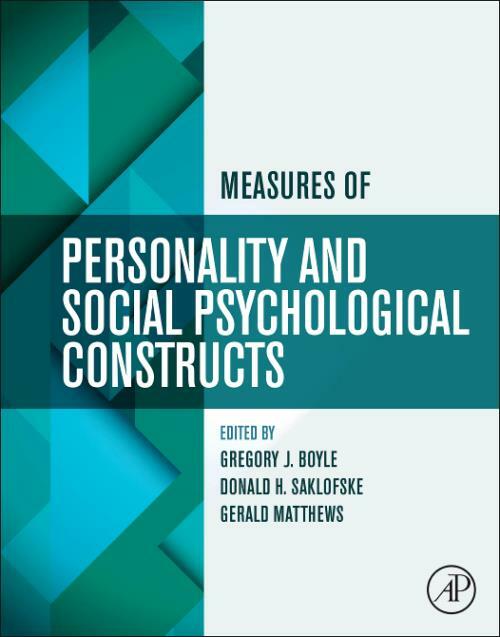 Measures of Personality and Social Psychological Constructs assists researchers and practitioners by identifying and reviewing the best scales/measures for a variety of constructs. Each chapter discusses test validity, reliability, and utility. Authors have focused on the most often used and cited scales/measures, with a particular emphasis on those published in recent years. Each scale is identified and described, the sample on which it was developed is summarized, and reliability and validity data are presented, followed by presentation of the scale, in full or in part, where such permission has been obtained. Measures fall into five broad groups. The emotional disposition section reviews measures of general affective tendencies, and/or cognitive dispositions closely linked to emotion. These measures include hope and optimism, anger and hostility, life satisfaction, self-esteem, confidence, and affect dimensions. Emotion regulation scales go beyond general dispositions to measure factors that may contribute to understanding and managing emotions. These measures include alexithymia, empathy, resiliency, coping, sensation seeking, and ability and trait emotional intelligence. The interpersonal styles section introduces some traditional social-psychological themes in the context of personality assessment. These measures include adult attachment, concerns with public image and social evaluation, and forgiveness. The vices and virtues section reflects adherence to moral standards as an individual characteristic shaped by sociocultural influences and personality. These measures include values and moral personality, religiosity, dark personalities (Machiavellianism,narcissism, and subclinical psychopathy), and perfectionism. The sociocultural interaction and conflict section addresses relationships between different groups and associated attitudes. These measures include cross-cultural values, personality and beliefs, intergroup contact, stereotyping and prejudice, attitudes towards sexual orientation, and personality across cultures. Dr. Boyle is a Professorial Fellow at the MGSE, University of Melbourne, and Head of School at the Australian Institute of Psychology. He was previously Professor of Psychology at Bond University, Gold Coast, Queensland for over 20 years where he also served as Associate Dean for Research. He is a Fellow of both the Association for Psychological Science, and of the Australian Psychological Society. In 2005, he was recipient of the Buros Institute of Mental Measurements Distinguished Reviewer Award. Dr. Boyle has lectured at Oxford University, Stanford University, and Princeton University. He has more than 200 publications, is co-author of a book on statistical methods, and is Senior Editor of several international handbooks. Dr. Donald H. Saklofske is Professor, Department of Psychology at The University of Western Ontario, Visiting Professor at Beijing Normal University and International Research Associate, University of Florence. He is a Fellow of the Association for Psychological Science and the Canadian Psychological Association. Don's research focuses on personality, intelligence, individual differences and psychological assessment. He has published more than 300 journal articles, book chapters and books. He is Editor-in-Chief of Personality and Individual Differences and Journal of Psychoeducational Assessment.